The next generation of Huntington High School Blue Devil marching band members will be given a glimpse of the fabled program during a workshop set for Tuesday, October 16. Current band members will host eighth grade J. Taylor Finley Middle School band members for an “educational and musically enriching workshop,” said Eric Reynolds, district director of fine and performing arts. The workshop will serve as a recruitment event for the high school marching band program, offering the eighth graders insight into what joining the Blue Devil band family would mean to them. 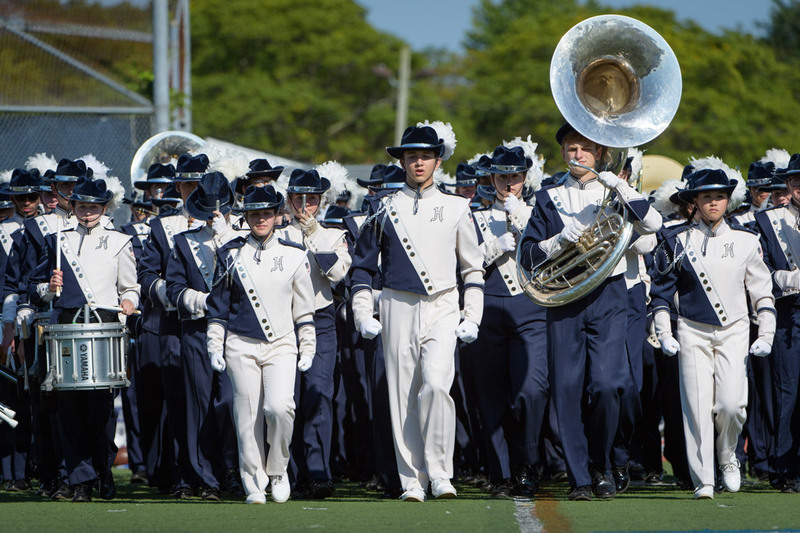 “This particular event will be an introduction to the Huntington Blue Devil marching band and to make personal and musical connections prior to the annual open house in April, which is a more formal, informative evening for parents and students,” Mr. Reynolds said. The Finley eighth graders will depart the middle school at 10:30 a.m. and head into the high school auditorium upon arrival for a brief overview of the day. The Band Parents Association of Huntington is treating participants to lunch, which will be followed by a performance by the full Blue Devil marching band at 11:45 a.m. The high school band leaders will then teach the Finley eighth graders an assortment of marching commands and drill. A “march-off” will follow before the middle school student-musicians depart for Finley at 1 p.m.
“This is shaping up to be a tremendously exciting and memorable day for all involved,” Mr. Reynolds said. Contact Mr. Reynolds (ereynolds@hufsd.edu) or 631-673-2106) for more information.